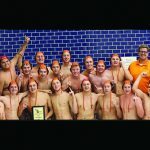 The Rockford Men’s Water Polo team began their week by putting their number one ranking on the line as they traveled Monday to meet the number two ranked team in the state, the Hudsonville Eagles. The game was played in a packed house as the Eagles celebrated senior night by honoring 14 players. The match up was much anticipated by both teams, with each looking at this contest as one of the most important of the season. The crowd would not be disappointed as they enjoyed four periods of outstanding play, excellent coaching and intense emotion. Hudsonville dominated early as senior Kody Brinks electrified the crowd by scoring the first three goals of the game, knocking the Rams onto their backs. Brinks was on fire in the first half scoring four goals. Ram senior Justin Hulsebus scored at the two minute mark in the 1st period to lock the score at 1-3. Rockford’s leading scorer and hole-setter, Grant Beach was held scoreless for the contest, double and triple teamed. The Rams were, however, able to hurt Hudsonville by moving the ball around finding the open shooter. Senior Mike Arend capitalized by scoring a team leading three goals against the Eagles. Two of Arend’s goals would be his unique shovel shots. In the second period, the Rams responded with four goals. Ram junior Jacob Davis caught fire scoring twice and wore Brinks down with his physical defense. The emotional boost for the Rams came with 28 seconds left in the half as Brinks swam free on a breakaway only to have his shot stopped by Ram goalie Corey Fase. At half-time, the game was locked up at 5-5. In the second half, the contest continued to be intense, with outstanding play from both teams. At the three minute mark in the third period, the Rams gained the lead and ended the period with a one point advantage, 8-7. The fourth period began with Rockford junior Reese Patino finding the net twice. 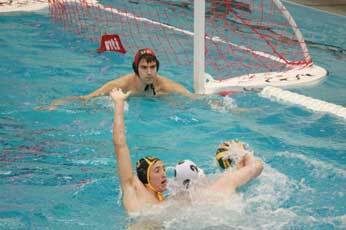 Arend added one of his three goals to close the door on the Eagles as Rockford came out of Hudsonville’s pool with an 11-7 victory. Both teams pulled their starting line-ups out of the pool at the 1:30 mark to a standing ovation from a very appreciative crowd. Rockford coach Dave McWaters said after the game, “We are very proud of what these young men accomplished here tonight—playing in the toughest of conditions, away in a pool of irregular depth and size, a huge home crowd celebrating their 14 seniors, competing against a very tough team with the highest of ambitions. Our senior leadership was tremendous.” Team leaders were Arend with three goals, Senior Nick Willison with five steals and two assists. Goalie Corey Fase had 12 saves in the net. The Rams defended their number one ranking and moved their record to 23-0. On the weekend the Rams travelled to the lakeshore to participate in the Zeeland Bird House Bash Invitational. On Friday night Rockford faced off against the Hornets from Saline. Seniors Nick Willison, Justin Hulsebus and Grant Beach dominated the first period of play combining for 5 goals and 5 assists as Rockford overpowered Saline to take a 9-2 first quarter lead. The Rams success continued through the second period as Hulsebus and Willison added one more goal each while junior Stephan Cress found the net twice. The second half saw scores from Jacob Brown from out front and a beautiful cross cage lob goal from Ben Hoffmeister. Freshman Jacob Fase “borrowed” senior Mike Arend’s patented shovel shot in the fourth period to finish out the scoring as the Rams swam away with it 16-7. Saturday morning Rockford faced the Grandville Bulldogs. The Rams continued their focused play as five different players scored in the first half, led by Willison’s two goals. Both Beach and junior Jacob Brown put it between the pipes from hole set. The defensive highlight of the game came with 44 seconds left in the first half as Ram goalie Corey Fase blocked a Bulldog break-a-way shot. In the second half Cress scored twice and Hoffmeister muscled the hole set also finding the net twice. Rockford chalked up a 12-4 victory. In Rockford’s final contest they faced off against the host Zeeland Dux. In first period the Rams came out strong scoring 6 goals. Hulsebus started it off by scoring from the point out front. He was followed by two hole set goals by Beach, a cross cage goal from Willison, two shovel shot scores from Arend and with one second left in the quarter Jacob Fase scored from the right, crossing the cage. In the second quarter Hulsebus once again started the scoring by finding the net from the point. Willison, Cress, and Beach each added a goal and then in the last minute hole setter Ben Hoffmeister put in two goals. Rockford continued to move the ball extremely well and dominated the Dux on their way to a 13-5 victory. The Rams record now stands at an impressive 26-0.